Kali is a cult personnage. Created by Umachandran and adopted to screen by Mahendran, Mallum Mallarum features Kali. Not only Kali was sketched as an unusual man, Mahendran gave it entirely a different attire. Joining hands with them is Balu Mahendra who focuses on the material identified by Mahendran and follows Kali as someone walking around and not as a 'hero' who is spinning around. Illayaraja produces all sorts of vibrant sounds that ressonate around Kali. The difference that is brought out through Kali is that his character was over topped by his attitude. This made a whole difference to the personnage Kali, which make every suituation he is in quite realistic and reveiting. To understand this, the difference between character and attitude should be understood. A character is a fixed entity. Like - an individual is a good guy, he can't harm anyone, he is always there for you, he loves this or that etc. So his action do not differ in suituations, but he is the same irrespective to whatever happens. On the other hand attitude is the approach of an individual given a particular suituation. He can cry when others laugh, he can jump when others walk. It depends on the likeness or agreeness the individual has towards the suituation. And also its according to the method by which one approaches a given situation. An attitude drives the suituation and allows itself to be driven by it. Kali has an immense attitude. He choses to be respected, at the same time he is the one who deceides whom to respect. Kali is a calm man, a helping natured but immediately become a bad mouth. He is proud to be Kali, and does not wish to share it with others. He does not do anything to impress anyone, but does what he feels is right. So on so forth, there are several points in the movie where Kali is potrayed in such an attitude with class. The brief clip below, shows the various attitude of Kali right from feeding the fish, helping a aged person, ignoring strangers, bad mouthing ladies, saluting the workers, making fun of others and finally cracking jokes with his collegue. A single man, Kali, show all this diversities is what makes this personnage so different. There comes an episode in his life, until when he leads a breezy life, his character brusts out of his attitude. As the real character of Kali cannot change, we come face to face with Kali after that incident. But again, the changeable, his attitude, takes a curve and he becomes soft natured and irridicates anything and everything with a smile. Here is the cult scene. After the incident, he is judged unfit. His boss calls him to his office. The posture he takes to wait outside shows the change in his attitude as well as the way he greets the office boy. Kali is before his boss. His boss announces the news. Kali accepts it with a stride showing the brilliance in his attitude. That look with eyes glitering with tears and the dialogue delivered with shivering lips all the while hiding the out brust and then staring at the emptiness are the peek moments of Kali, where his character and attitude collide with each other. 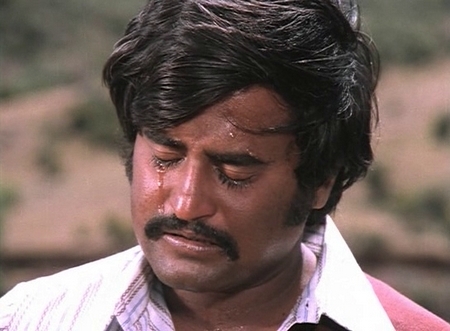 And I forgot to mention, the person who plays Kali in the movie Mullum Malarum is Rajini. Last edited by mappi; 24th February 2015 at 08:37 PM. Excellent stuff as usual ! The Shiva thandavam in Kochadaiyan still send shivers down my spine! ARR has done wonders with song, though Aum shivohum from "naan kadaval" is on a league of it's own! 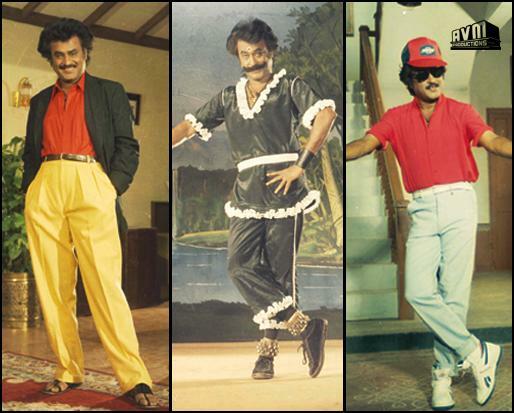 Rajini Style vs Madan Style ... Avo Dhost ... Lovely. Is it ? Fantastic. An amazing song from Engeyo Ketta Kural. 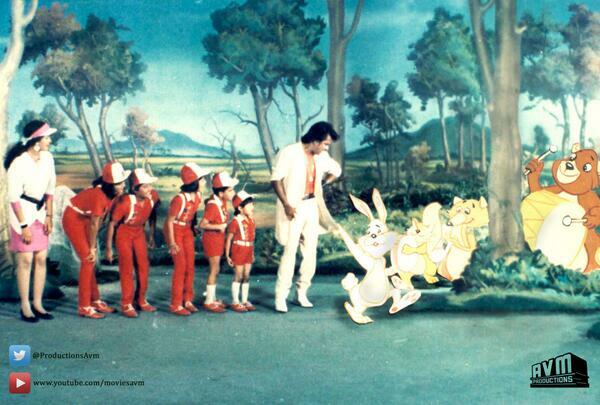 Straight Telugu film by Rajini. Plays Rashid, younger brother to NTR. Action & Fun Packed end-of-70s explosion movie. Eventhough someone dubbed for Rajini, we can see that he is the one who spoke in Telugu and not doing 'chewing' gum performence. There are serveral long dialogues in the film, and towards the climax Rashid talking to his mom is top notch. He also gets a Bar Dance Song (with a 'digestion stick' between his lips) along with that period's sensation Jayamalini, followed by an awesome slo-mo Karate fight. A Must watch. Adhe pullarips, ippovum appadiya thaan irrukku !